Organic chemistry is the study of the properties and behavior of chemicals containing carbon as the key element. These compounds are both the basis of all life on earth (we are all made of organic compounds) and a large focus of the chemical industry (e.g., pharmaceuticals, plastics, advanced materials, fuels). This course aims to show the relevance of scientific and chemical knowledge in everyday life and to advocate for the importance of scientific literacy in modern-day decision-making. What are your favorite teaching strategies in this class? By far the most functional way to present this material is by free-hand drawing on a whiteboard. Although it may sound hopelessly old-fashioned, this delivery method provides a comfortable pace that students can follow while taking notes and listening to the my explanation. Importantly, it also teaches students the craft of organic chemistry, in addition to the science. 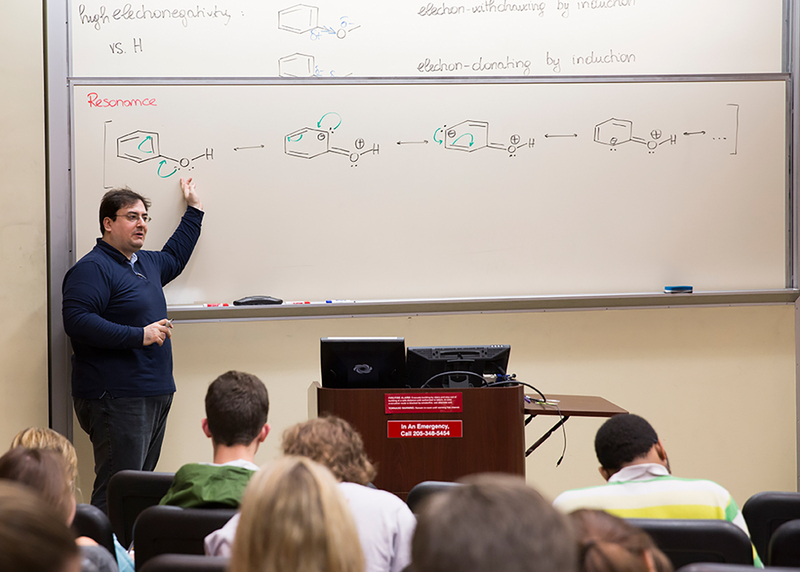 In fact, organic chemistry is a highly visual discipline; any conventions exist as to how certain concepts are represented, and students have to learn them to understand and master the material. Just like practicing syntax and grammar is a key part of learning a new language, so it is also with the visual language of organic chemistry. Students have to learn how the three-dimensional structure of molecules is represented on two-dimensional paper and what these symbolic representations mean. Though writing on the white board is still very effective, I have successfully used some technological equivalents, like drawing on an iPad that’s connected to a large projector screen or providing screencasts with video and voiceover. Additionally, student engagement is fundamental. I routinely challenge my class of 150-200 students with questions and wait for them to respond. It doesn’t matter whether they get the answer right or wrong; either one allows me to assess their understanding and adjust my lecture on the fly. Have you introduced something new to enrich or enliven this course? I strive to make connections between the course material and my students’ two fields of interest. Considering that more than 50% of my students are biology majors, and a large portion of them are interested in health professions, I often make connections between the material presented in class and biology, biochemistry, and health topics. For example, we talk about the chemical difference between saturated fats vs. unsaturated ones, and among unsaturated ones, of cis- vs. trans-fats, the latter two representing classes of molecules that again differ only by the spatial arrangements of components in space. We discuss the implications on the properties of these fats, and on their chemical behavior when used in high-temperature application (e.g., frying). I also try to connect the material to how it is used in the chemical and pharmaceutical industries or in everyday products. What else do you want your students to leave your course knowing? I want them to know organic chemistry is not just a collection of reactions, that it provides the foundation both for understanding how life works at the molecular level, and for the transformative technologies that have revolutionized our daily lives in the last century.